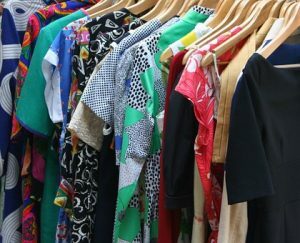 One in three items hanging in our wardrobe hasn’t been worn for a year so here’s how to make some money from your old clobber. If you’ve got stuff that’s still got the tags on and is relatively new then taking it back to the shops is your best bet. Most high street shops have generous ‘returns’ policies which means they’ll swap or give you money back on ‘unwanted purchases’. But you’ll have to produce the receipt or some other form of ‘proof of purchase’. And you can usually only do this for around a month about you’ve bought it; not five years later……. Worn it but still looking good? I’m a big fan of eBay and often pick up great bargains that are advertised as new or ‘worn once’. In fact I even turned a profit on a fabulous Coast dress I once bought for a New Year’s Eve party for just £10. Wore it on another two occasions, sold it back and still made money! Boost your selling potential with clear photos taken in really good light. Donate any item of Marks & Spencer clothing to Oxfam charity shops and you’ll get a £5 M&S voucher that you can use when spending £35 in store, excluding food and gift vouchers. Dropping items in the ‘Shwop Drop’ bins in store also means 50 points on your Sparks card. And you can earn Nectar points at Oxfam when your join its Tag Your Bag scheme. You’ll get 100 points on joining and another 2 points for every £1 raised when your items sell. John Lewis is trialling a ‘buy back’ app where you should soon be able to sell back worn or unwanted clothes you’ve bought in store. You’ll get a price per item and once you’ve sold back £50 of clothes you get a gift card. Get a £20 voucher when you hand in your old ones at Runners Need which has nearly 40 stores across the UK. Hand over any brand of trainers you like to get the voucher and exchange them for a new pair either in store or online. Drop off any unwanted clothes in the special bins in H&M and you’ll get a £5 voucher to spend in store. From the new year you’ll be able to sell items to this site that’s just come over from France. Sells good quality second hand clothes from mainly high street brands and right now you can buy, with the option to sell from the new year. Does shopping at outlet malls actually save you money? Factory outlets and outlet malls all promise big discounts of up to 70% but can you really bag a bargain? I love a bargain but I’ve always been a bit sceptical about outlet malls and never found the bargains live up to the hype. In fact I actually came away out of pocket on one occasion when I left empty handed, but having shelled out for coffee or lunch during my bargain hunting day. And when it comes to eating and drinking at these places, there’s usually no cut price deals in the cafes or restaurants. On a recent trip to Manchester for a travel feature, I popped into the Lowry Outlet at Salford Quays. Spying the Cadbury shop I whizzed in hoping to snap up some cheap chocolate, only to find the prices flagged up were actually more expensive than some supermarket deals. Prague is a stunning city but there’s lots of ways to see the sights and save money. I’ve made a one minute video version below or read on for my top five moneysaving tips. If you want to use the city’s buses, metro or trams you can buy a 30 minute ticket for 24 Czech Koruna, that’s just over £1. Or if you want a longer trip; go for the 90 minute version at around £1.50 or an all day pass that comes in at around £4. Getting from the airport into the city is cheap and easy. We took the 119 bus from the airport to Nádraží Veleslavín and with two short metro trips we were in the centre of the Old Town within an hour and all for around £1.50 which is the price of a 90 minute ticket. Plus these ‘all in’ tickets work on Prague’s Funicular Railway too, which is worth a trip, and takes you to the top of Petrin Hill for some stunning city views. 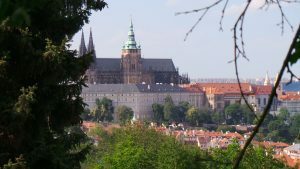 Well worth a visit and it’s actually free to get into the Castle grounds and gardens H But if you want to go inside the Old Royal Palace or get further than the entrance of St. Vitus Cathedral you’ll need a ticket. Ticket prices start from around £3 for the Castle Picture Gallery up to around £15 if you want one that gets you in pretty much everywhere. We went for ‘Circuit B’ which costs the equivalent of £10 and gets you into four of the main sites including both the Cathedral and Old Royal Palace. And getting there is easy. Hop on the number 22 tram that takes you to within a five minute walk of the Castle. Tours can eat into your holiday budget so why not take a free walking tour of Prague. These free tours meet every day at the bottom of the Astronomical Clock in the Old Town Square. If you want rooftop views over Prague you can head for the Old Town Hall Tower but you’ll pay 250 CZK for the view; which is around £10. We escaped the crowds to enjoy both views and beers from a different angle at the T-Anker bar This hidden gem is on the top floor of the Kotva department store, just a five minute walk from the Old Town Square. Plenty of beer to try but I’d recommend their own one which works out at just over £2 a pint. 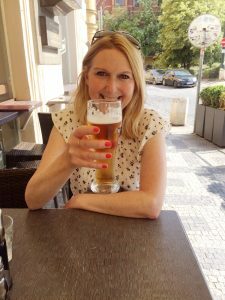 In case you didn’t know, the Czech Republic is famous for its beers, so worth popping by the Prague Beer Museum to sample the local brews as they’ve got 30 different ones on tap. You can order a selection of ‘taster’ sizes of the local brews as well as the full sized versions and there’s plenty of snacks including some delicious fried cheese that won’t break the bank. Nice may look pretty fancy but there’s plenty of ways to see the sights and save money. I’ve just been there to see a friend for a couple of days and absolutely loved the place. And it’s easy to get there. It was just a two hour easyJet flight from Luton and if you jump on the number 98 bus at Nice airport, you can be on the beach in around 10 minutes. I’ve always been a cabin bag kind of girl, (unless my hold luggage is included in the ticket price! 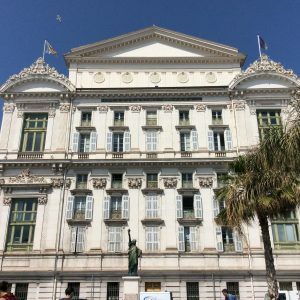 ), and if you’re happy to travel light, then I reckon Nice has got to be one of the easiest weekend breaks in terms of speedy arrival so you can enjoy every minute and won’t waste several hours trekking to and from the airport. 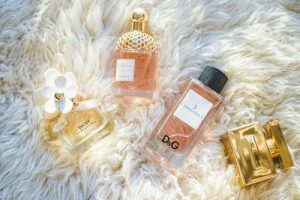 So here’s my tips on making the most of your time and saving some cash along the way…. Pick up the 98 bus at the airport which goes all the way along the seafront, or Promenade des Anglais to give it its correct name and it’ll set you back just six Euros. Nice airport is so close to the centre of town that you could actually walk it. Yes it saves money, but unless you’re happy to do around an hour’s walk in the heat and got super small cabin luggage youmight regret it. Yes, I know, I haven’t got my countries muddled up. You really can see a smaller version of this iconic statue outside the Opera House on the Quai des Etats-Unis. In fact most people miss it, as it’s not that big, (around four feet high), but well worth stopping to take a look. And in case you didn’t know, the designer of the world famous statue was French; one Frederic-Auguste Bartholdi. Head for Castle Hill if you want a stunning panoramic view over Nice. You can climb the steps or get a free ride in the lift, which is slightly hidden away, but saves your energy in the heat. Long story, but don’t expect a castle at the top as that’s long since gone but it’s a beautiful area to wander round with views over Nice and you can see the port from the other side. Most people take their snaps from the top but if you head down a few steps to the waterfall you can even get the view all to yourself. Half the fun is getting lost in this labyrinth of narrow streets packed with shops, cafes and squares with open out to reveal some stunning churches. Stop for ice cream at Fenocchio which has two sites in the old town. 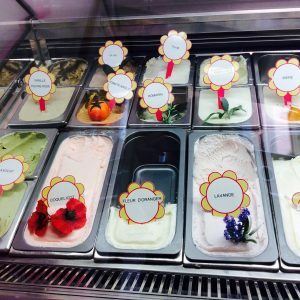 This family run ice cream place has over 80 flavours, from the rather unusual ones like Cactus, Poppy, Beer and Avocado to some truly yummy ones with my favourites including white chocolate, both honey and nuts and Baileys. Yes at two Euros a scoop it’s not cheap, but worth it, and if you pick up a crepe or galete for a couple of Euros, you’ll have a cheap lunch. Or pick up some pastries from the Moulin de Flor bakery. Plenty of restaurants to choose from if you want to eat on the beach. One of my favourites is Sporting restaurant and beach But while it’s great with delicious food and great service, you will pay for the experience so if you want to save money you’ll have to be prepared to swap that lunchtime beach view. So why not pick up some snacks around the Cours Saleya market as there’s plenty of pavement cafes there. Or for authentic and delicious tapas style finger food, head for Rene Socca, which is tucked away in a backstreet in the old town near Garibaldi Square. We shared several dishes, had a couple of glasses of wine and still had change from twenty Euros. Nice is a fabulous place to watch the world go by. 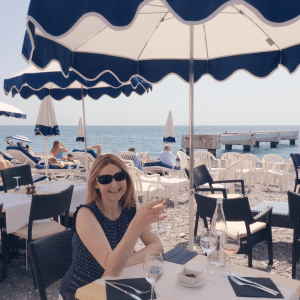 Plenty of free seats along the Promenade des Anglais, so you can stop and take in the views, take some snaps of the iconic Negresco hotel, (or pop in for a drink if you can afford it), or go and sit on the beach. Why can’t all holiday hire car companies be like this? Booking holiday hire car can sometimes seem like a lottery when it comes to weeding out the good guys from the rip off brigade. So having written a fair few pieces over the years about the ‘problem’ side of car hire, I wanted to share my experience of how car hire can be done well. And to say ‘well’, is doing this company a disservice as it’s not just doing it well, but five star well, amazing and immaculately well, and all topped off with super friendly service too. I’ve recently got back from a trip to the Greek island of Kos. It’s a beautiful island, I absolutely love it and while some parts are known for a bit of party lifestyle, we always head for the laid back village of Kefalos. And we always book our hire car direct with Dimitris Rent A Car It’s a family business, based in Kefalos, and run by Dimitris and his wife Maria, who are two of the most friendly and welcoming people on the planet. I’ve got to start by telling you how clean these cars are. They’re not even super clean; they’re absolutely immaculate; both inside and out. I have no idea what Dimitris uses to clean his cars, and I’ve often told him that they’re the cleanest hire cars I’ve ever seen. I reckon he must use some kind of ‘dust repellent’ on them as however much Greek dust you drive through, they still come out looking clean! We’d had ours the best part of a week by the time we took this snap and as you can see it’s still looking good! Now while my smattering of Greek means I can get by ordering drinks in a bar and ask for the bill, I’d be seriously in trouble if I had to translate a hire car contract. But easy enough as here the contracts are written in both Greek and English so you don’t having to worry about missing anything and it’s all super straightforward and easy to understand. Some hire car companies insist on filling the tank and whacking on a surcharge before they’ll hand over the keys. But not with Dimitris, it’s all done on trust. You check what’s in the tank as you drive off and make sure you return it with the same amount. Some companies try and add on a surcharge for nearly everything. Want to collect your car from the airport? That will cost you more. Want to drop it back at the airport? That can bump up the bill again. 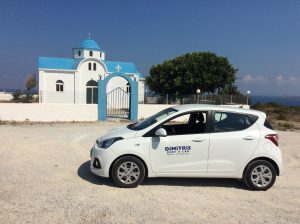 But here’s the deal with Dimitris Rent A Car, no hidden extras or charges; you pay a flat daily rate with all the prices clearly listed on the website. Prices start from a very reasonable 20 Euros a day and insurance is included, so no hidden extras, or push for any more cash. And you get a free road map and 24 hour breakdown cover as part of the deal. Once you’ve handed in the keys or finished up for the day don’t leave Kefalos without popping into the Acropol bar on the harbour road. Just a couple of minutes walk from the hire car office, it’s owned and run by Dimitris, Maria and the whole family and it’s a great place for watching the sun go down with a beer in your hand or enjoying a cocktail or two. And make sure you try Maria’s Mum’s lemon cake too; it’s beyond amazing!